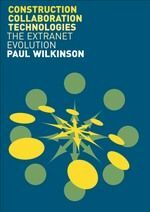 Paul Wilkinson is one of the UK’s leading authorities on construction collaboration technologies (once known as ‘project extranets’), having written, among other work, the industry’s definitive guide to the market, vendors and tools – Construction Collaboration Technologies: The Extranet Evolution, published by Taylor and Francis in September 2005 (available from Amazon). the Institution of Civil Engineers (he is deputy chair of the ICE’s Digital Transformation community of practice, formerly the Information Systems Panel). His ExtranetEvolution blog is required reading for anyone with an interest in web-based construction collaboration, Software-as-a-Service (SaaS) and collaborative working. His interests also extend across other construction IT subjects, including building information modelling (BIM), mobile, the Internet of Things and Open and Big data.